Coming off tours with Rhapsody in Europe and Angra in North America in 2018, Romania's Scarlet Aura returns with third long player, Hot N Heavy. 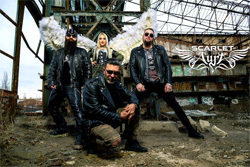 The band self-released the album in digital format in the Fall of 2018, but now it gets wider promotion through Silver City Records. 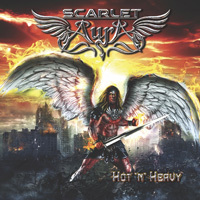 My recollection of the previous album Falling Sky was that Scarlet Aura played mostly melodic hard rock with a metal edge. 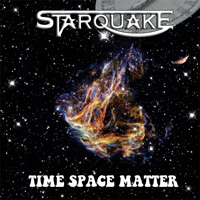 Now, however, the reverse is more true: melodic heavy metal with a rock groove. You'll find that the songs are more hard and heavy, with sharper riffs and a thicker bottom end from the rhythm section. Additionally, and somewhat disturbing, vocalist Aura Danciulescu can sound raw and harsh at times, like she took up a heavy smoking habit or has been gargling nails. While I can appreciate the band's turn towards more heavy metal rock, I grew weary of Ms Danciulescu's coarse vocal character. To be fair, she can be controlled and more clean singing within the heavy ballads Fallin' To Pieces and Light Be My Guide. Vocals aside, I found some interest in two songs, Hail To You and the power metal rocker, In The Name Of My Pain. In the end, after listening twice and writing this review, I really had no desire to listen to Hot N Heavy again. But fans may feel differently. There's plenty of videos from the album on their web site. Check them out and, if you dig their new heavier sound, support the band. In the end, after listening twice and writing this review, I really had no desire to listen to Hot N Heavy again. But fans may feel differently.